79 FACT BOOK 2015 m ETRO m AGAZINE > suppliers paratransit, shuttle and prisoner transport vans. We are also a Champion, Federal And General Coach Bus dealer. Vans and buses always in stock for fast delivery. Mohawk Lifts/Div. of Mohawk Resources P.O. Box 110 Amsterdam, NY 12010 Phone: (518) 842-1431 • (800) 833-2006 Fax: (518) 842-1289 info@mohawklifts.com www.mohawklifts.com Mohawk, manufacturer of vehicle lifts, ofers two post, four-post, mobile column, portable scissor, and parallelograms ranging from 6,000 to 240,000 lb. capacities and an array of options. Mohawk's lifts are proudly designed, welded and manufactured in the U.S. Mohawk Mfg. and Supply Co. 7200 N. Oak Park Ave. Niles, IL 60714 Phone: (847) 647-9350 • (800) 323-7652 Fax: (847) 647-1499 info@mohawkmfg.com www.mohawkmfg.com John W. Brown, pres. Robert L. Brown, exec. VP Sarah L. Brown, sec./treasurer Established in 1958. Specializes in replacement parts and engineered solutions for the transit and motorcoach industries. Representing preferred vendors: Goodyear, Koni, Gabriel, Dura-Lite, Exodor, Stabilus, Truck-Lite and Haldex Mobile Climate Control Corp. 3189 Farmtrail Rd. York, PA 17406 Phone: (717) 767-6531 • (800) 673-2431 Fax: (717) 764-0401 info.na@mcc-hvac.com www.mcc-hvac.com Curt Kiser, sales dir., small bus & parts Jack Sharbaugh, eng. mgr. 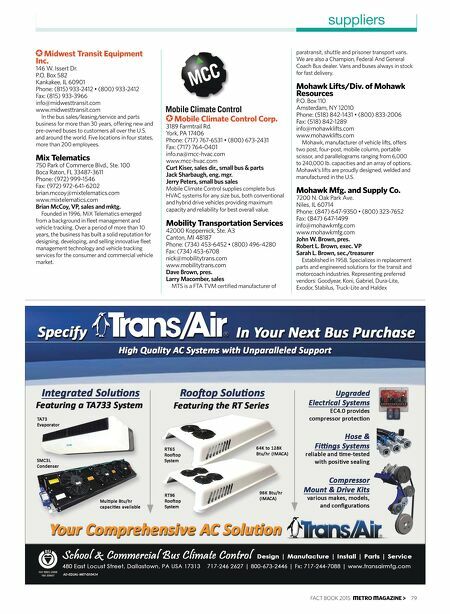 Jerry Peters, small bus sales Mobile Climate Control supplies complete bus HVAC systems for any size bus, both conventional and hybrid drive vehicles providing maximum capacity and reliability for best overall value. Mobility Transportation Services 42000 Koppernick, Ste. A3 Canton, MI 48187 Phone: (734) 453-6452 • (800) 496-4280 Fax: (734) 453-6708 nick@mobilitytrans.com www.mobilitytrans.com Dave Brown, pres. 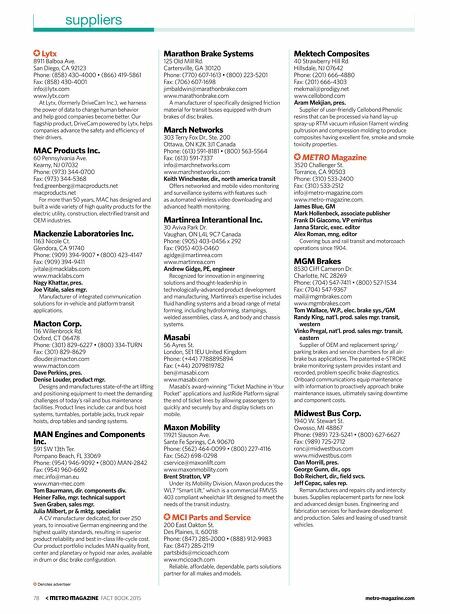 Larry Macomber, sales MTS is a FTA TVM certifed manufacturer of Midwest Transit Equipment Inc. 146 W. Issert Dr. P.O. Box 582 Kankakee, IL 60901 Phone: (815) 933-2412 • (800) 933-2412 Fax: (815) 933-3966 info@midwesttransit.com www.midwesttransit.com In the bus sales/leasing/service and parts business for more than 30 years, ofering new and pre-owned buses to customers all over the U.S. and around the world. Five locations in four states, more than 200 employees. Mix Telematics 750 Park of Commerce Blvd., Ste. 100 Boca Raton, FL 33487-3611 Phone: (972) 999-1546 Fax: (972) 972-641-6202 brian.mccoy@mixtelematics.com www.mixtelematics.com Brian McCoy, VP, sales and mktg. Founded in 1996, MiX Telematics emerged from a background in feet management and vehicle tracking. Over a period of more than 10 years, the business has built a solid reputation for designing, developing, and selling innovative feet management technology and vehicle tracking services for the consumer and commercial vehicle market.